Dentistry is a profession dedicated to promoting and enhancing oral health leading to the overall wellbeing of an individual. While accomplishing this, dentists are likely to be exposed to various biological health hazards. A biological hazard or biohazard is an organism, or substance derived from an organism, that poses a threat to (primarily) human health. 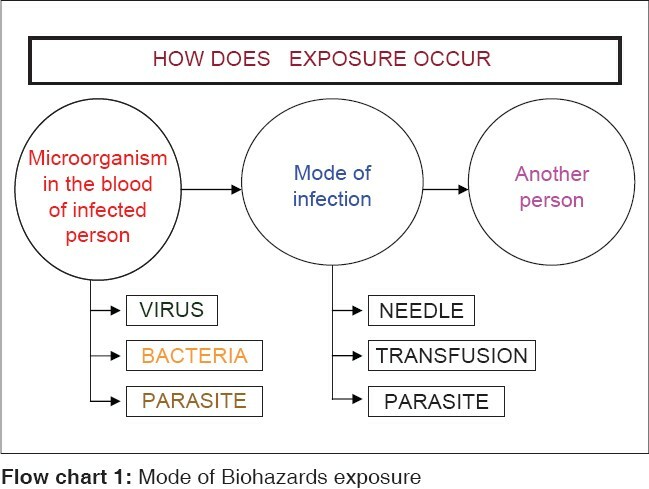 This can include medical waste, samples of a microorganism, prions, virus or toxin (from a biological source) that can impact human health [Figure 1]. Charles Baldwin, a retired environmental health engineer, in 1966 developed a symbol of biohazard. Labels must be fluorescent orange or orange-red with the biohazard symbol or biohazardous waste lettering in a contrasting color [Figure 2]. A dental office generates a number of hazardous wastes that can be detrimental to the environment if not properly managed, as a result of which dental practitioners have been increasingly prone to be exposed to these biohazardous waste materials. So it is important for the dentist to know how to manage and prevent this exposure by securing basic knowledge of biohazards components. This article is a brief review of levels of biohazards and baseline preventive measures as applicable to dentistry. It is an ethical responsibility to be aware and follow all the preventive measures against biohazards to help oneself, patients and the environment. A proactive approach will allow our profession to succeed in an era of increased public environmental concern and environmentally proactive legislation. It is not only our legal obligation to provide dental services that benefit the public at minimal expense to the environment, but also our moral and ethical obligation. 1. Available from:http://www.dallas-biohazardcleanup.com; December 9, 2007. 2. Occupational hazards of dentistry. Ann Agric Environ Med 1999;6:13-9. 3. University of Kentucky College of Dentistry Infection Control Manual V. 3.0 10/1/06. 4. Office of Occupational Safety and Health - 2006. 5. Infection Control Update 06. Nicholas J. Grimaudo, University of Florida College of Dentistry. 6. Community college of Philadelphia operating procedures for exposure to infectious agents-EXPCONTR/5/2/TG. 9. Howard University College of dentistry policy manual 2006- 2007. 10. JCDA. Available from: http://www.cda-adc.ca/jcda.September 2007;73:7. 11. Dental hygiene manual 2007-2008. 12. Occupational exposure to blood borne pathogens; final rule. CFR part 1910:1030. September 23, 2002. 13. University Hospital Foundation Medical Research Competition Guidelines - 2007. 14. School of dentistry, 2007-2008, committee assignments and charges, September 27, 2007.